Are you all so excited? My friend Amber made these bows and flowers just for this giveaway. I was definitely not blessed in the bow making area, trust me, I've tried with no avail. Amber makes beautiful bows. I will be selecting a random commenter through random.org. I'm not sure when the next giveaway will be, but it will be on a Wednesday, and I am VERY excited about it! By the way, you may all have a heart attack when you see my next post. Just a hint...I wasn't expecting it to be so short. I just wanted to let you know that you have some very cute ideas! It's nice to see another little girl with such long hair. I started a blog with my 3 princesses and some hairdo ideas that we have. I hope that you don't mind that I linked you and that I mentioned your site today. Ok I found you through She Does Hair and totally wish my daughter had long hair like yours. She is really into bows though so I would love to win. Here's my comment and thanks for sharing your ideas and talents. You cut off Piper's hair?! Gorgeous! I need friends like yours to make my 5 girls bows! Oooh, I especially like the flowers (I can never find good flowers!) but they are all adorable. Love your blog! Very cute! I have a guess about the next post...can we expect some different types of hairstyles in the future?? Yeah! Very cute bows! I can't wait until my daughters' hair grows so I can do all the fun things you do with Piper's! Those aqua colored ones are adorable! Love your blog and my girls do to. Keep it up. Always up for fun new things - especially when they are given away! I need to find some friends like yours! Very cute stuff. I love the bows! I love lurking on your blog. I love all the hairdos you come up with and Piper is adorable!!! I absolutely love your site. Thank you for all the great ideas! I love hair bows! I am new to all of the hair blog sites. My girls seem to have hair that is too short for most of the styles, but we're growing it out as we speak. But bows are one thing that we can use!! You have a great site and I can hardly wait until my girls have long hair!! thanks so much! 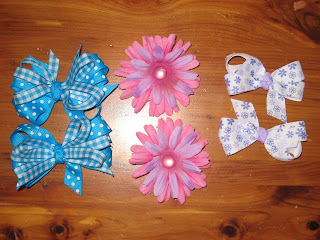 Cute bows and flowers and wonderful hair ideas!! Love 'em all....I hope your daughters hair didn't get accidentally cute off?! How tragic we'll hope that is not what the next long/short post is. Love your site, I check it daily, because, well, I am just not creative, so you take care of this for me. Thanks! Such cute bows! I love your site. We are in the process of growing hair out at our house, so I am excited for your next post. Cute bows-- Count me in! Love the bows...count me in! I love the hairdos! Keep 'em coming! I've tried three so far! Thanks for your efforts!! :) The bows are too cute! Your blog is so FUN! I love all the new ideas, and seriously.... those bows are GREAT! PICK ME!! Cute, Cute, Cute! I love your ideas and those bows are so darling! I wonder if I could possibly win this giveaway? That would be awesome! Thank you! I love hair accessories for my baby. Count me in! I love to look here for new ideas for my little 2 yr. Her hair is still really short and baby fine, but I have been practicing with some of your ideas. I love them. The flowers and bows are darling! Thanks for all the great ideas. I REALLY need to learn how to make bows. these are darling! Love the colors of the flowers! Your site is great! Love the bows and love your site! Thanks for sharing your talents. Sign me up for the giveway! Beautiful bows...I'm trying to learn how to make them, but not quite getting it yet! I could give these to my niece who now has enough hair to put cute bows on! my little one is having a hard time with her hair these past few days, so these bows would be perfect to make her feel a little better about her new, unplanned haircut. Thanks for the giveaway. I love these bows--your friend is very talented! Oh I love bows and wish I could make them too. Tried but failed. I love your hair designs, I need to try more of them. I am a mom of Three girls. I have been stalking your blog for a while from She Does Hair and I love your ideas. My daughter has shorter hair and it isn't very thick (yet) but she is getting better at letting me mess with it. My baby is 18 months and she is still bald--barely enough hair for a clippie. But my 4 year old would love these! Great giveaway! I love these bows! They are so pretty! Thank you for the giveaway! With your next post that we may have a heart attack... did you cut your hair or piper's? The bows are cute! I have tried once before... I don't believe I was blessed in that area either...lol! Pick Me! I love your blog! Love your blog and those bows!